Investors remain complacent even though history shows a major stock market correction looms. Interest rates should stay low for a while, however, so you have time to adjust your portfolio. This story was originally published on August 18 and updated on August 21. NEW YORK (TheStreet) -- There are several interrelated reasons investors should be worried about another big correction in the U.S. stock market: investor complacency and inflated risk-asset values, poor domestic and global economic fundamentals, and normalization of interest rates and corporate profit margins. It has been 666 days and counting without at least a 10% market correction. History offers lessons about what's likely to happen. The China slowdown has shown signs of continuation and potentially acceleration in recent days, prompting massive turmoil in Asian equities markets. China was down 11.5% this week, mostly in the last two trading days, while Japan was down over 5% this week. In turn, U.S. equities markets have been trending down while credit markets have responded relatively well (in a flight to safety), consistent with our view that rates do not rise meaningfully and sustainably any time soon, regardless of Fed action. 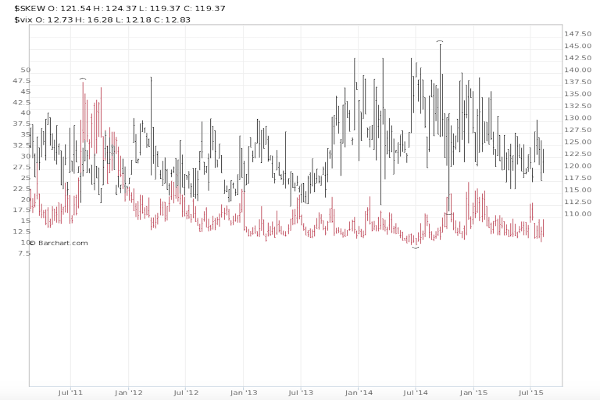 Most signs point to material systemic risk in U.S. equities markets. The vexing question as to where do equity markets go from here persists: at what point do negative domestic and global fundamentals plus inflated risk asset values outweigh the leavening effect of zero-bound interest rate policies? Tranquil periods in stock market history, defined as uninterrupted stretches in which the S&P 500 closes within 10% of its all-time peak, never end well. Historically, low downside volatility is the backdrop for sudden and sometimes precipitous instability (a tendency well explained by Hyman Minsky's "The Financial Instability Hypothesis"). The S&P 500 is currently in the fourth longest streak of tranquility since 1960. Each of these periods was sustained by a unique and ultimately flawed narrative, from the tech bubble of the 1990s -- the most enduring -- to the credit/housing bubble of the 2000s -- the shortest. The current streak, of course, has been animated by quantitative easing and zero-bound interest rate policies. The median maximum drawdown (in other words, the maximum decline in the S&P 500 index, adjusted for dividends, from a market peak) following such tranquil periods is -43%, typically occurring within 13 months of the end of the tranquil period. Moreover, the median annual market total returns over the subsequent 10 years from the peaks achieved during such periods is just 2.5%. (Note that the November 2006-January 2008 period includes only eight years so far.) It is also worth noting that the 1987 "Black Monday" drawdown occurred only days after the peak, and the return period coincided with the unprecedented period of tranquility of the 1990s. Clearly, history suggests the risk-reward of staying fully invested in the stock market this late in a period of tranquility is dangerous, especially given the high current valuations as measured by the market price divided by average trailing 10-year earnings, known as a cyclically adjusted price-to-earnings ratio, or CAPE. The CBOE Volatility Index, also known as the VIX or "fear index," tracks at-the-money and close-to-the-money front month S&P 500 option premiums, or "insurance" against a market correction. The VIX indicates the broader market's perceived "tail risk" -- that of a major correction -- and is currently indicating low perceived risk (see chart below). Another CBOE index, the CBOE SKEW Index, tracks the pricing of out-of-the-money options and reflects large institutions' perceived tail risk for the market. It too is signaling complacency. Big movements in the stock market don't prove valuations are expensive or cheap, but they certainly provide some directional assistance in making that determination. 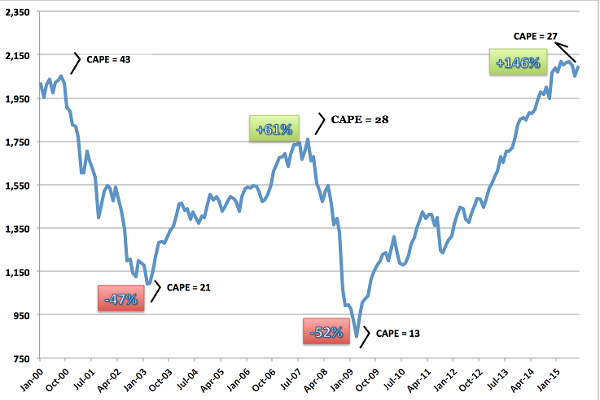 CAPE is not much of a trading tool, but it offers a useful touchstone on basic market valuation. The chart below shows some incredible movements in the stock market since the tech bubble. It also reveals that three of the four highest readings of CAPE in history (distinct episodes) were observed during this period. The fourth occurred just before the 1929 stock market crash. Source: Robert Shiller, Irrational Exuberance; and Yahoo Finance. 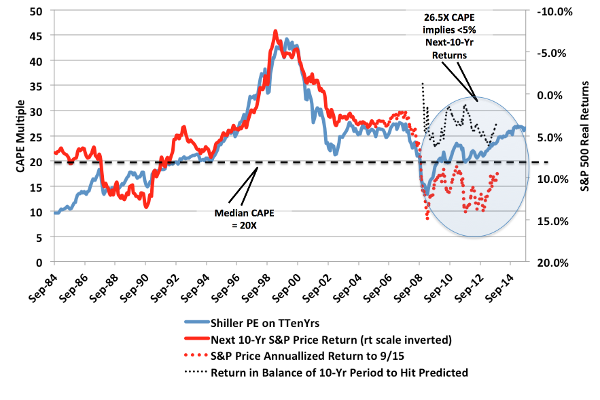 The chart below shows the historical value of CAPE when it reaches extreme levels to predict incremental real stock market returns, relative to long-term averages. Aligning actual annualized S&P 500 stock market returns in the 10 years that followed each historical reading of CAPE reveals a close correlation. Current levels of CAPE predict below-average stock market returns over the next decade -- less than 5% per year in what will likely be an increasingly volatile ride. The U.S. and world are halfway through a 15th year of anemic production growth by historical standards. 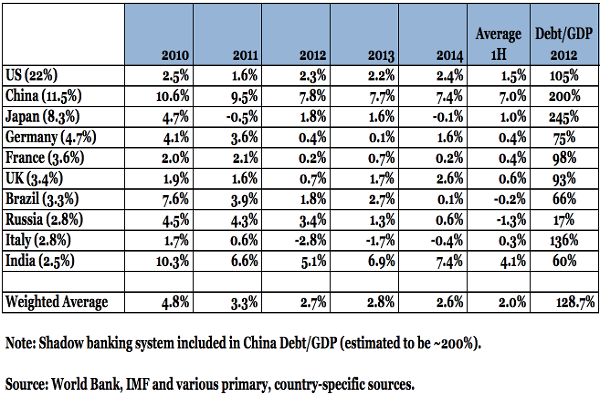 The table below shows decelerating GDP growth for 67% of the global economy, just 11 nations, as well as debt levels for each. Growth forecasts have been steadily revised downward over the last several years, and events in China and Europe should only add to that pressure. Sovereign debt levels above 90% portend contractionary public policy in the form of reduced federal spending and increased taxation, and have been linked to significantly slower economic growth. The slowdown in growth relates to a number of factors, and demographic trends in advanced economies are chief among them. 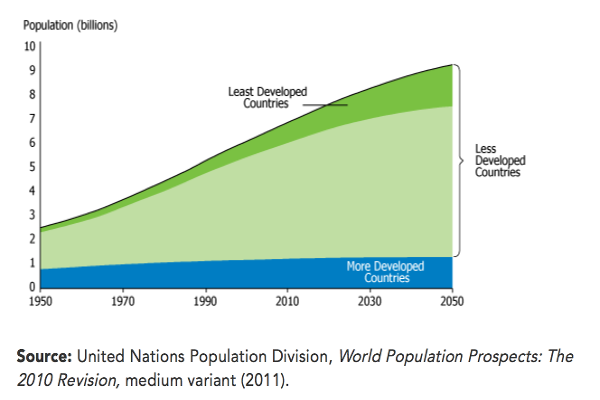 The chart below shows the flatlining of population in the developed countries that represent most of the global economic base. Only productivity gains can generate economic growth in the absence of growth in the labor force, and productivity growth has been decelerating. U.S. corporations are reporting record profits, but cost-cutting has been the driving force behind the small growth observed. Earnings per share for the S&P 500 have grown 5% per annum since the end of 2012 compared with a bit more than 1% for sales, and corporate profit margins remain nearly 70% above the long-term average, suggesting corporate growth cannot continue in the absence of top-line growth. Since 1964, a premium of the 10-year U.S. Treasury yield over its long-term average has accurately predicted concurrent stock market declines 71% of the time. The long-term average yield on the 10-year is more than 5%, compared with less than 2.5% currently. The direction of interest rates has predicted concurrent market tranquility/stability 83% of the time since 1960, which helps explain the stock market recovery from the financial collapse. The 10-year has been range-bound between 1.5% and 3.0% since June 2011, but a maximum drawdown of 30% or more has not occurred when the 10-year yield was below 3.9% in the last half century at least. Although the Federal Reserve is preparing to raise rates as early as September and there is not much room for rate declines, we do not see interest rates rising meaningfully and sustainably before 2017. Hence, there's no need to panic just yet. Protracted periods of stock market stability promote excessive risk taking and an inevitable and often painful correction. The pain is exacerbated when the valuations get particularly rich. The overlay of weak and deteriorating macro and microeconomic factors paint an ominous picture for equity investors whose not-insubstantial consolation is that interest rates are not likely to rise meaningfully and sustainably given such a backdrop.